Madison Bishop, right, working on her short film. Senior motion pictures major Madison Bishop is already experiencing success in the entertainment world. 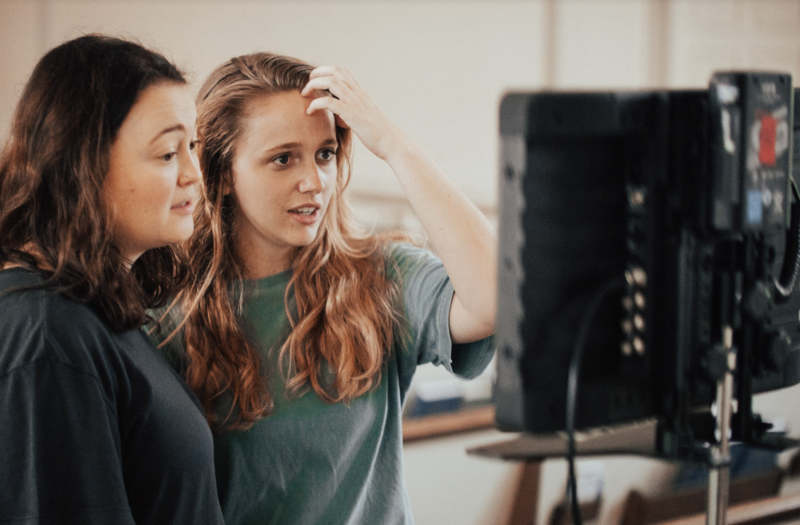 Having recently completed her senior capstone film, a requirement for all motion pictures (MOT) majors, Bishop decided to enter her film into festivals and contests to see how it could do. She recently found out her film won three awards at IMDb’s Independent Shorts Awards for March 2019. Bishop’s senior capstone short film was based on her personal experiences going to a high school with strict dress codes. The film, titled “In God’s Image,” relates to those experiences and focuses on one girl’s experience at a strict academy. The main character struggles with the sexism she finds in dress codes and works with her peers to take a stand. The road to creating the final product of “In God’s Image” began over a year ago. Throughout much of her motion pictures curriculum, Bishop worked on gaining the skills to make her film and then eventually focused on bringing it to life. Through the courses Production 1 and 2 and Senior Capstone, students write and produce their films, starting at 5-7 minutes and then eventually finishing at 10-15 minutes. Bishop’s short film won three separate awards at the IMDb Independent Short Awards. It won Gold in both the Best Student Short and Best Women Short categories and also won Bronze in Best Cinematography.